Okay! Musume Time: An Introduction to the Fairies who Make You Melt! Let's Meet: elfloat! An Introduction to the Fairies who Make You Melt! Let's Meet: elfloat! It has really been a while since I last introduced and profiled an Idol group, to the point where I really can't even remember which group I profiled last, or what year I profiled them in. I know I give updates on HouPri now and again, what with member changes and all that jazz, but that doesn't count as a new profile, or at least it doesn't to me. So, it's a pretty good thing I have found a new group to profile! Granted, there are only three members, but it's still a new group profile, none-the-less! So, without further ado, let's take a look at a shiny group I have suddenly found interest in. Who have I found to profile today? Introducing elfloat, a group of cute, young Idols who have a concept of Fairies who melt just like ice! Currently, elfloat is under the agency blue clover, a Music Video Production company, as their sole Idol group and also their first group in general. The group made their activity debut back on May 24th of 2014, and participated in the SEKIGAHARA IDOL WARS 2014 event on May 28th. Currently, the group consists of three members, however they originally debuted with four girls, up until one members graduation back in November of last year. Right now, though, the group seems to be stable with just the three of them - the group is, however, currently holding auditions for new members, so elfloat may have new members very soon! Despite their short tenure as a group, being barely a year old at this point in time, the group has already released one single, six music videos and have performed at various venues, as well as held their first one-man live back in November of last year. For such a young group, it really feels like they have done a lot in such a short time, especially for a group that is under an agency which has only just started to produce a group. Also, as a random (but also relevant) bit of background information regarding their agency blue clover, the company has produced many music videos, with Houkago Princess and READY to KISS being two Idol groups the company has recorded for. Upon watching elfloat's music videos, I wondered why the style of filming was so familiar... no wonder, they were recorded by the same company! So, there's some wonderful trivia for you all. Keep that safe in your memory bank for whenever Houpri next record an MV in a similar location, or with a similar style to something elfloat have done. I've only known about these girls for barely an evening as I write this, but honestly, I am rather besotted by them already; I enjoy their music, I like their image, and their videos aren't half-bad, either, though what else could we expect from a group that came out of a Music Video production company? If anything, elfloat are an intriguing trio of girls, and I only hope that they can become even more interesting as they grow together, as well as stronger in sound and video production. In a way, it will be rather intriguing to watch them, both elfloat as a group and blue clover as a production company for Idols like these girls. Given the fact that blue float are also looking for girls to audition for a new group, too, I feel there will be even more to expect from them this coming year! I look forward to it! 1) HOW ARE YOU NEARLY 20!? This chick is my oldest niece's age, but dang, she doesn't look it! 2) I love that she seems to have a quirky, fairy-related hobby, but photosynthesis!? Wonderful xD I don't get it, but I actually really love this random, quirky hobby that aids their 'Fairy' concept. I like her face. A lot. Also, her age is a tad more believable, but she's seriously too cute to be 18 right now! Ah, well, whatever~ At least these girls are decent ages, so far! Also, have you seen how cute she is!? Wow, what a looker! The Nectar thing is damn weird, though o 3o Still, gotta keep with that Fairy theme, right? So far, she's my favourite in terms of aesthetic appeal, I believe, though I still have some getting used to them. Anywhoo... NEXT!!! Okay, this one is a beauty. Like, DAYUMN, you are a gorgeous vision of supreme beauty and loveliness. Like, hi, can I hold your hand, lovely lady? Really though, she is great to look at, but I can't believe she's almost 20... whoa. In general, I can't believe that any of these girls are close to the age of 20. Whoa. 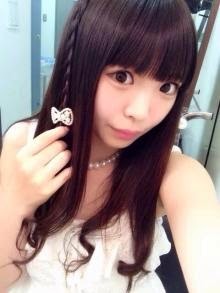 Reason for Graduation: Though she felt that she and the other members had grown in half a year as elfloat, Moka also had anxiety and conflict within herself regarding her time as an Idol, especially when it came to popularity, or lack of, and being the center of the group. For this reason, it seems, that is why she chose to graduate from the group. I was not the most popular member. about half a year ago. But due to this, I decided to graduate after talking to management and others." Many thanks to Amy for her help in a small translation, and for confirming that what I read was indeed right. There really is not a lot on Moka, given that she is a graduated member and all, so I really know nothing other than her name, the day she graduated, and a little bit about just why she graduated. Even with why she graduated, it seemed that Moka could not handle being a center girl for the group, a center who may not have been very popular or even the #1 most popular member of the group she was a part of. No matter what her reasons are for graduation though, it feels sad that she left so early on, and if what I have read is right, it is even sadder as to why she left. Honestly speaking, I actually would have liked Moka if I had been a fan of the group at the time she was present; she's really eye-catching, and the first member I actually noticed when watching the videos for the first time. I can see why she was made a center - she is beautiful! It's sad that she has left, but her time within elfloat was surely treasured, even if it was only by her fans, herself and the other members. She is missed, I am sure. So far, this is all of the information regarding the group that I have collected, aside from their six PV's that I have yet to post here, that is. There really is not a lot in regards to the girls that I know of right now, other than what little I have managed to dig up and write here. Still, it is their obscurity that intrigues me, the same obscurity that lead me to my obsessive love of HouPri. One can only hope that it is this very obscurity that is what keeps me intrigued with elfloat. This is the groups first official song, and is present on their first single as well; Elf Shot is a mix of live performance, practice shots and backstage footage that shows off their energetic cuteness, their tears and their closeness as a group. It's a nice video to watch, I think, especially for a first music video - it introduces the group, in all of their strengths and weaknesses, and the song is really cute, too. As a whole, I really enjoy Elf Shot. I don't mind the fact that the lyrics are in the middle of the screen, either, though it does obscure their cute faces. Oh, well! I want to randomly note that, within the video, READY to KISS make a small appearance as the members of elfloat watch them perform before they take the stage. I also noticed that, in the video, the group performs at and practices in Ikebukuro White Base during some parts of the video - this is the same venue that HouPri performed at before regularly performing at COCONUTS STAGE and RUIDOK2. This was really interesting to see for me, considering I am a long-time fan of HouPri, so it was worth pointing out, at least for me. I believe this to be their second song, and this is their first location-based music video, too. The second I saw it, I knew immediately that the location was the same as the one used for Juliet ~Kimi wa Suki na 100 no Riyuu~ (2013 ver.) by Houkago Princess. Even the filming style of the same, but they were both done by the same company, so there's the answer to that. Either way, though, elfloat's Tokiori Mermaid is really cute in vision and sound - it is very darned pretty. This was actually the first video I saw from the group, and it was the location that caught my eye at first, however I do like this video and song. The song is better than HouPri's Juliet tune actually, don't shoot me for saying that as it is very cute and airy, and also very catchy. For an introduction video to the group, this is a good one; it's filmed really well, and the song is adorable. The second I heard this song, my immediate thought was 'This is a Hikari Ishitani song', and I was really surprised that I recognised Hikari's work without even reading who the composer and lyricist was for PAIN~Ai no Akashi~, but I suppose Hikari's sound is very... obvious, especially for Idols. Still, as a song, PAIN~Ai no Akashi~ is fun and cute, but it's just so HouPri, it's baffling. I like the song, don't get me wrong, though I admit it isn't my favourite of all the songs elfloat has produced so far; it's cute, but not the strongest, either. The video is pretty good though! I love the tone of it, and though it feels so small during the dance shots, it's still a pretty fun watch. Of all the songs, let me just tell you that Vampire Castle is the most surprising. I won't spoil it for you, but it's nothing like the other songs in my opinion; it starts off a little creepy with a certain sound effect, and then it just gets... well, it's a dark song, and it's an interesting choice for elfloat. Personally, this is not my favourite track, but I do enjoy what it has to offer, it's intriguing sound, and how it differs from the other tracks I have heard from them prior to this one. The videos enjoyable, too! Borderline is the first song and music video to feature Elfloat's current three-member lineup, and is another video that shows elfloat's ever-varying video concepts. I suppose that's the beauty of being an Idol group under a Music Video production company; you have ave some advantage in being able to create pretty decent content, because honestly, this video is pretty good in terms of production value. It isn't on the same level as AKS, don't get me wrong, but it's better than some of the other Idol groups out there like, say, Hello! Pro. There is thought in this video, and yes, I enjoy watching it. In general, I seem to enjoy watching elfloat. 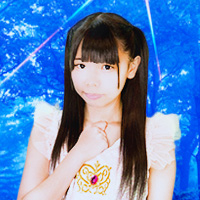 Also, I commend Hikari for making this song sound less like HouPri, and a little more distinct. I can still hear those HouPri compositions somewhere, however. 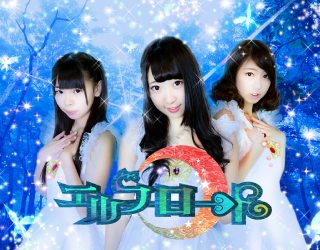 WHITE ANGEL is the groups latest single, and clearly, it is Christmas/Winter-themed. Despite being about a month late (it was released on January 17th), it is still a really cute music video and very darned Idol-y. It takes on your typical Idol themes of Winter dates, Idols in white, adorable costumes, Santa costumes, pouty faces and those darned signature Idol poses we all melt over! In a nutshell, this is one giant Idol affair of sweet, adorable cuteness, and I doubt I could get enough of it, even if I tried. And, with that, I have provided as much as I can for the group elfloat. They're still pretty new to the Idol scene, but in general, they are a rather intriguing group that has seriously peaked my interest. I enjoy all of their songs so far, and their music videos are fun to watch as well. Overall, elfloat are just a cute, spiffy group who have caught my eye, and aren't I glad that they did! I look forward to seeing more from them this year, because you can bet right now that I have them on my radar! Refreshing and intriguing, elfloat are a group that I want to watch grow as Idols and performers, and also a group that I want to learn more about; right now, their obscurity is what truly interests me, however their music and videos are also something that have struck a chord with me as a fan of Idols. I hope that, throughout the year that is coming towards us all, I can grow to enjoy elfloat even more, and if I'm lucky, grow to love them as I do HouPri, as well. In terms of Idols, 2015 is shaping up to be an interesting year so far. I've already found a new group to watch over, so I wonder... will more come along the way? Let's hope so. Until next time, please take care, and enjoy the Idols that may come your way! I Made a New Video... Took My Time, Didn't I?